SEATTLE, WA – Pratt Fine Arts Center is proud to participate in Veterans Glassblowing Day on November 8, 2014. 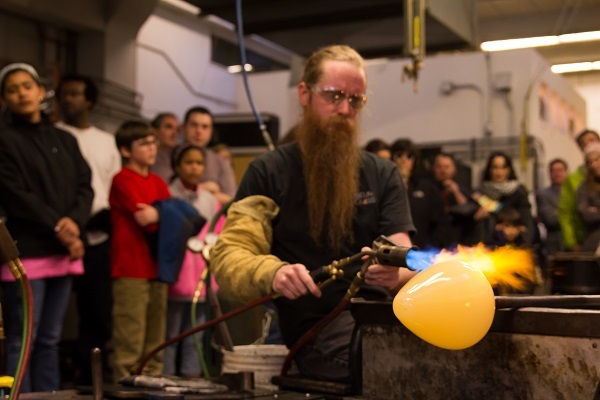 Organizations from all over the country are participating in this nationwide initiative by hosting a day of free glassblowing classes for the nation’s Veterans and provide an experience that is fun, challenging, and community driven. The goal of the event is to expose men and women to the world of glass art as well as affording troops the chance to develop a technical skill. Veterans Glassblowing Day hopes to unify the glassblowing community, and bring awareness to the craft and various organizations through their involvement. Veterans Glassblowing Day was initially inspired by President Obama's plea for citizens to help our Veterans find work after returning home from Iraq and Afghanistan. Following President Obama's passing of the Veterans Skills to Jobs Act in July 2012, longtime glassblower Lisa Aronzon was inspired by this call to action and invited the glassblowing community to come together in support of our veterans. As our nation faces financial uncertainty, social revolution, acts of violence, and military conflicts, Veterans Glassblowing Day offers a terrific opportunity for Americans to pay it forward to our troops. Pratt Fine Arts Center is proud to offer this opportunity to our Veterans. Pratt is The Place to Make Art. Veterans Glassblowing Day will take place on November 8, 2014 nationwide. Glassblowing schools across the country will open their studios for veterans to experience the craft of glass blowing. The long-term goal of Veterans Glassblowing Day is to create a non-profit organization that will offer scholarships for veterans to attend glassblowing classes and apprentice with professional artists. To provide United States veterans with a free opportunity to try the craft of glassblowing with the intentions of developing a marketable skill, building joy through artistic expression, and creating community through an annual national event. Lisa Aronzon has been a working glass artist since 1985, receiving her MFA in glass from California Collage of Arts and Crafts in 1992. After graduate school, Lisa worked in a cooperative studio for four years and then built her own studio in Oakland, Calif. in 1998. In 2006, Lisa relocated to Virginia, where she rebuilt her glass studio in the Shenandoah Valley. In 2012, Lisa responded to Presidents Obama’s request to help our Veterans return home from the Iraq and Afghanistan wars. She was inspired to create an event that would allow Veterans to experience glass blowing in their hometowns by organizing glass studios and workshops throughout our nation. The project called “Veterans Glassblowing Day” is scheduled for November 8th 2014, and Veterans will be able to attend a free Glassblowing Workshop at participating schools. Lisa hopes to take the VGD further by creating a non-profit scholarship program that will fund Veterans interests in pursuing a career in art glass. Mary Catherine has been working with glass for ten years and holds and MFA in glass sculpture from the School for American Crafts at the Rochester Institute of Technology. She has worked at Pilchuck Glass School, Corning Studio School, Penland School of Crafts and Ox-Bow School of Art. Her work explores material and its presence in space. She incorporates various media including cast iron, ceramic and glass, using the inherent qualities of materials and their interactions to comment on personal experience. Currently she is living in Rochester, NY.